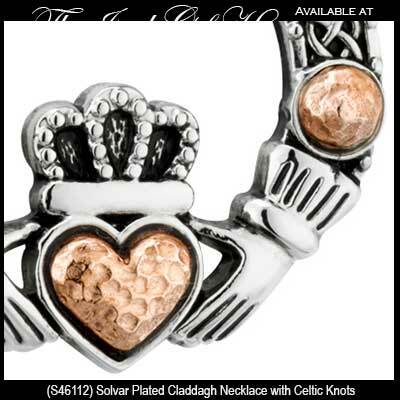 This Claddagh earrings selection will dazzle you with silver tones, gold plated and rose gold plated colors. 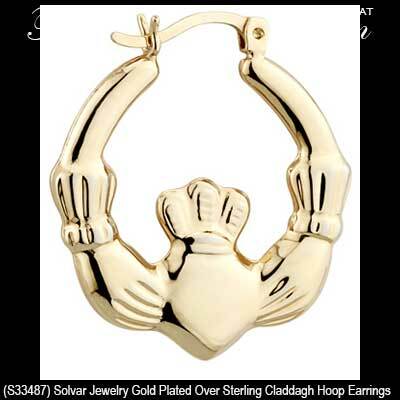 The Irish Gift House plated Claddagh earrings are featured as stud and hoop styles along with drop fittings with either fishhooks or latching Eurowires. 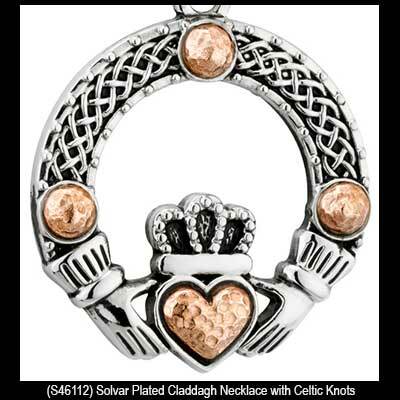 Our selections of plated Claddagh earrings includes those with traditional designs and several with contemporary accents such as Celtic knots. 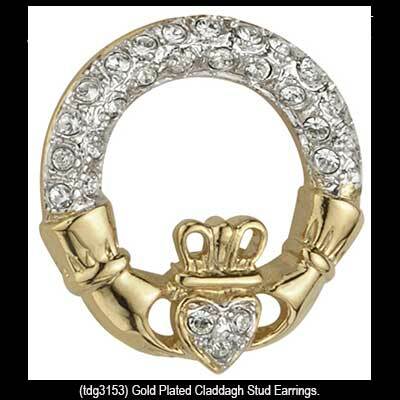 You may also select from plated Claddagh earrings that are set with crystals as accents or set in heart; we also feature several with enamel accenting. 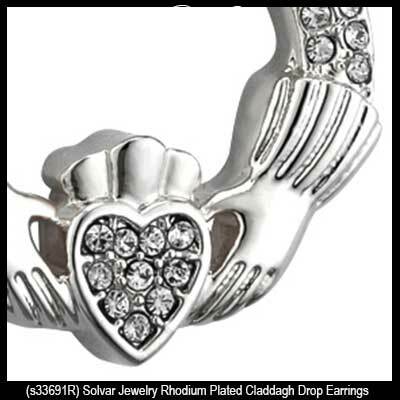 The silver tone Claddagh earrings feature two kinds: those that are silver plated and those that are rhodium plated. Just in case you didn't know, rhodium is a shiny white platinum metal. 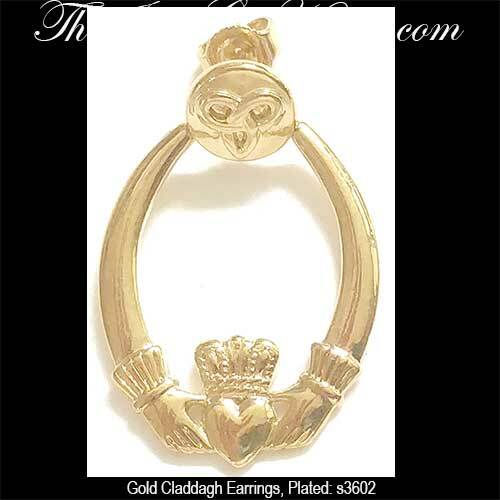 These Claddagh hoop earrings are gold plated over sterling silver. These Claddagh earrings feature a rhodium plated finish that is enhanced with freshwater pearls and crystals. 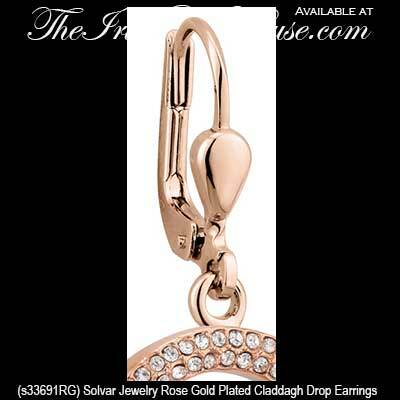 These dangle Claddagh earrings are a gold plated design that is enhanced with CZ stones. 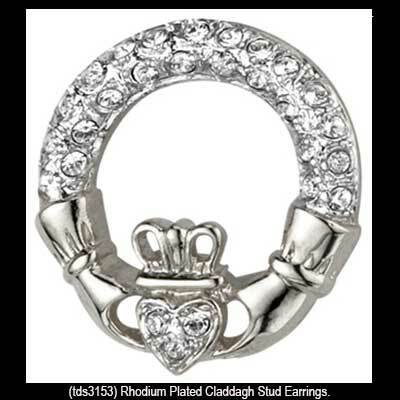 These Claddagh earrings are studs that are rhodium plated and enhanced with crystals. 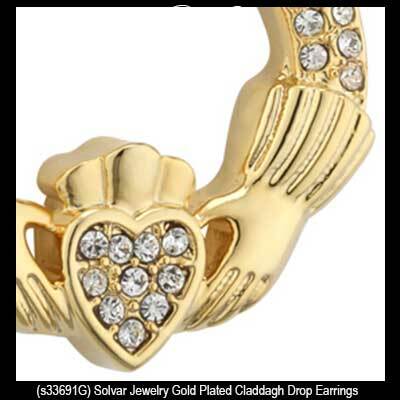 These Claddagh earrings are gold plated studs and enhanced with crystals. 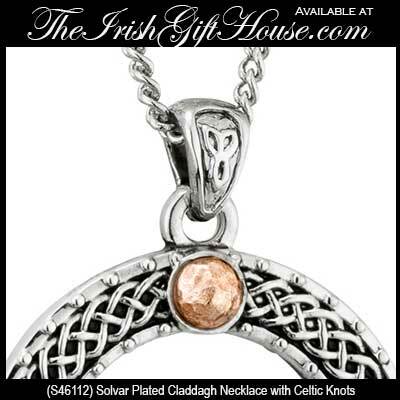 These plated Claddagh earrings feature rose gold accenting along with engraved Celtic knots. 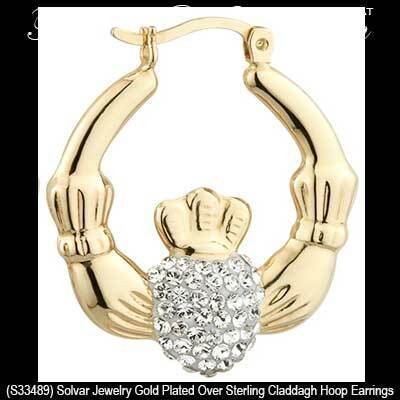 These Claddagh earrings are gold plated hoops that are enhanced with Trinity knot posts. 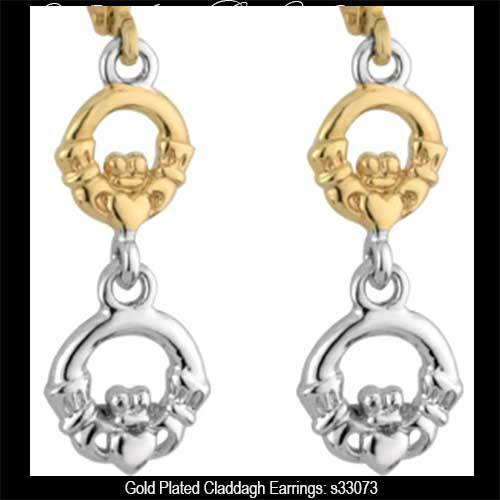 These Claddagh earrings are a dangle style that are enhanced with filigree Celtic knot-work. 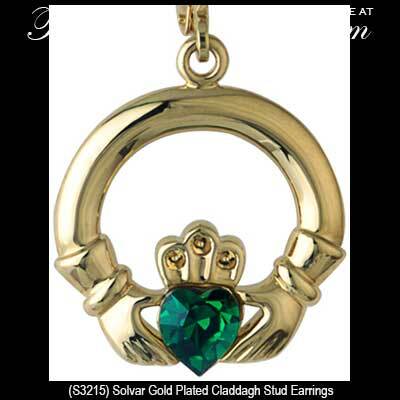 These gold plated Claddagh earrings are a dangle style that are enhanced with green crystals in the hearts. These Claddagh earrings feature a gold plated finish with green enamel accenting along with Celtic knot-work. These Claddagh earrings feature a rhodium plated finish with green enamel accenting along with Celtic knot-work. These Claddagh earrings feature a rhodium plated finish with black enamel accenting along with Celtic knot-work. 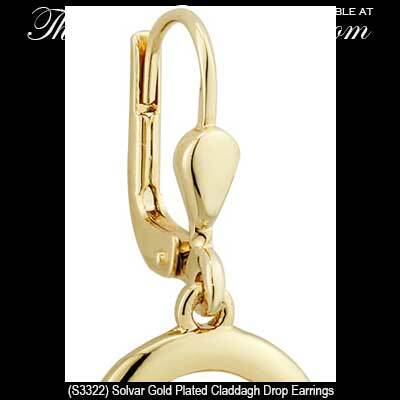 Sorry, these Claddagh drop earrings are now sold out. Sorry, these earrings are not in stock and we don't know if or when they may return. 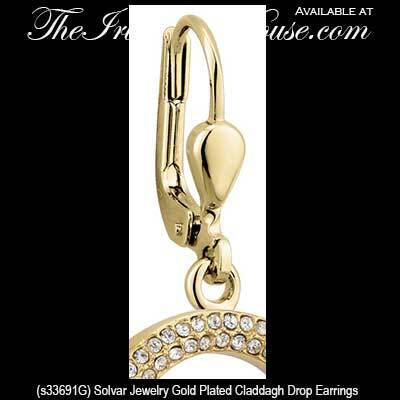 These gold plated Claddagh earrings are a drop style that are enhanced with green glass stones in the hearts. 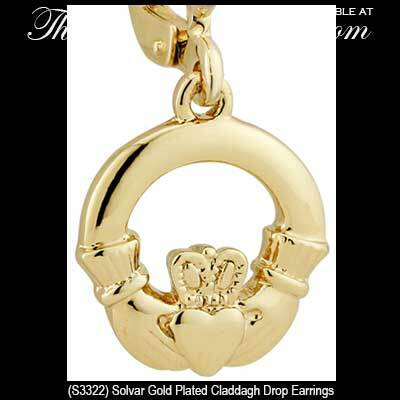 These gold plated Claddagh earrings are a dangle style that features a double two tone design. These Claddagh drop earrings are a plated design that is enhanced with green cat eye glass stones. 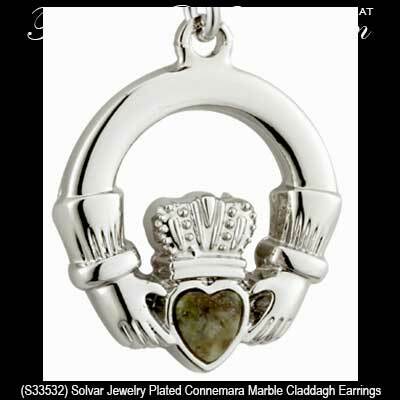 These plated Irish earrings may be worn at any event from formal to casual but you may wish to consider augmenting them with a matching Claddagh necklace. Continue adding to your collection with an emerald Claddagh ring; The Irish Gift House has them in both gold and silver. 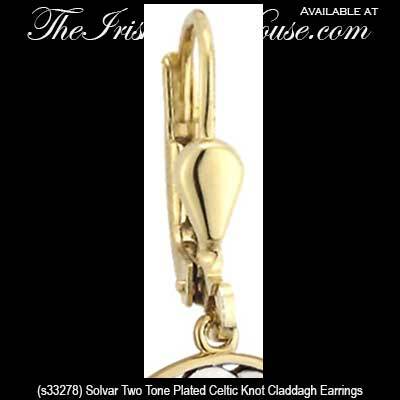 Our assortment of plated Claddagh earrings are made in Ireland by Solvar Jewelry.